Visit with us Prahova Valley (Carpathians Mountains) and Transylvania in one day private trip of 7-9 hours on which you can enjoy some of the most beautiful and popular objectives in the area: Peles Castle and Bran Castle. Peles Castle is one of the most famous castle in Romania situated in Sinaia City, along with Bran Castle. If Bran is linked somewhat to the Romanian ruler Vlad Tepes, Peles is distinguished by the fact that it was a royal residence over time, its sumptuous rooms being sometimes used as decors for American films.You have included: driver/guide,bottled water, lunch time/Shopping time, and we will also surprise you with a bonus. Take a day drip with us in one of the beautiful region in Romania Country and you will spend a magnificent day. You will have an unforgettable experience in Dracula's Land! Our trip starts from Bucharest, and in about 2 hours you will be in Sinaia City where you will visit the first castle: Peles Castle. The town was named after Sinaia Monastery of 1695, around which it was built. The monastery in turn is named after the Biblical Mount Sinai. King Carol I of Romania built his summer home, Peleș Castle, near the town in the late nineteenth century. Peles Castle is a masterpiece of German new-Renaissance architecture, considered by many one of the most stunning castles in Europe. Peles Castle was the first European castle entirely lit by electrical current. The electricity was produced by the castle's own plant.The castle has a theater room with 60 seats, the glass ceiling of the hall of fame is mobile, driven by an electric motor and since 1883 it benefited of central heating.The first movie projection in Romania is reported to have taken place in this room. To get to the next objective,Bran Castle,we will go through the Carpathian Mountains. 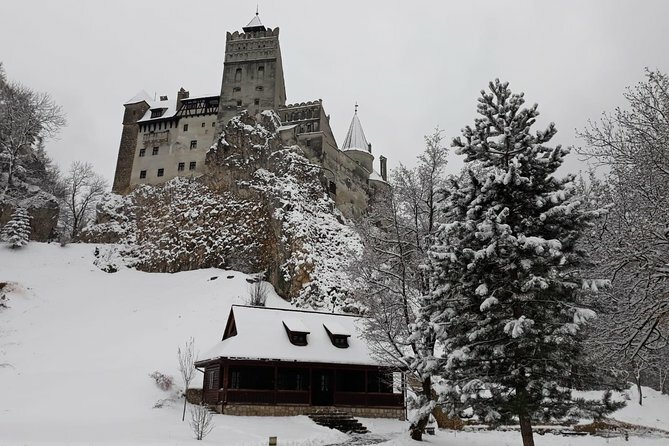 Surrounded by an aura of mystery and legend and perched high atop a 200-foot-high rock, Bran Castle owes its fame to its imposing towers and turrets as well as to the myth created around Bram Stocker's Dracula. Surrounded by towers and ramparts, this “pugnacious little fortress”, as Queen Marie called it, is a truly stunning castle, especially against the beautiful background dominated by the Carpathian Mountains.Narrow winding stairways lead through some 60 timber rooms, many connected by underground passages, which house collections of furniture, weapons and armor dating from the 14th to the 19th centuries. After visit Bran Castle if you wish,we can recommend you a good traditional place for lunch. After this fascinating experience in Carpathians , we will go back in the legendary shepherd Bucur town- Bucharest. Child seats are free of charge. In accordance with the legal provisions in force, the child seat is mandatory, please request at time of booking.